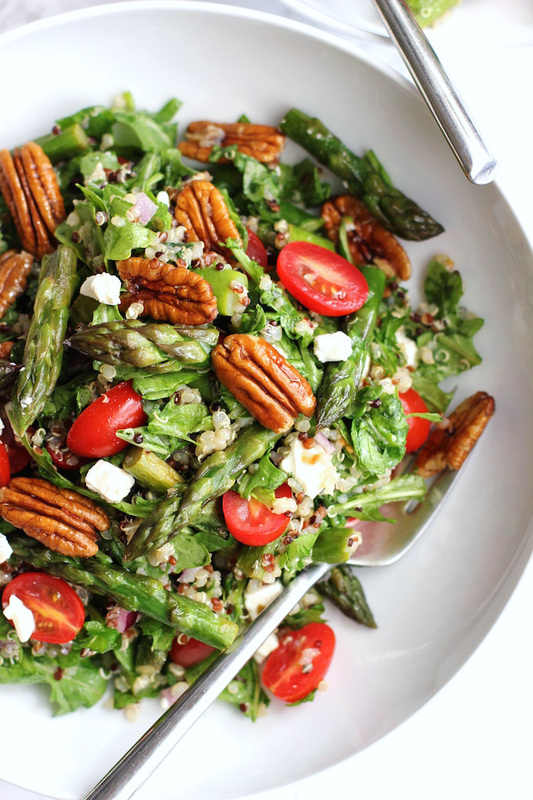 Quinoa salad with asparagus, cherry tomatoes and pecans. An easy quinoa salad featuring sautéed asparagus, sweet cherry tomatoes, crunchy pecans, salty feta and tossed with a lemon vinaigrette. Perfect for spring. Spring is here in Los Angeles. The signs are everywhere – birds chirping up a storm early in the morning, gorgeous flowers blooming everywhere and crates of asparagus at the market. So I’m sharing this quinoa salad with asparagus, cherry tomatoes and pecans to kick off spring. While we did not get the monstrous El Niño that was predicted, we did get enough rain to turn dry Los Angeles into a green, flowering oasis. Our usual brown, dusty canyon hills are lush with green grass. Bougainvillea and roses are bursting out all over – great splashes of gorgeous color. And I’ve never seen so many wildflowers before – whole hillsides awash in orange, yellow and purple flowers – truly a lovely sight. 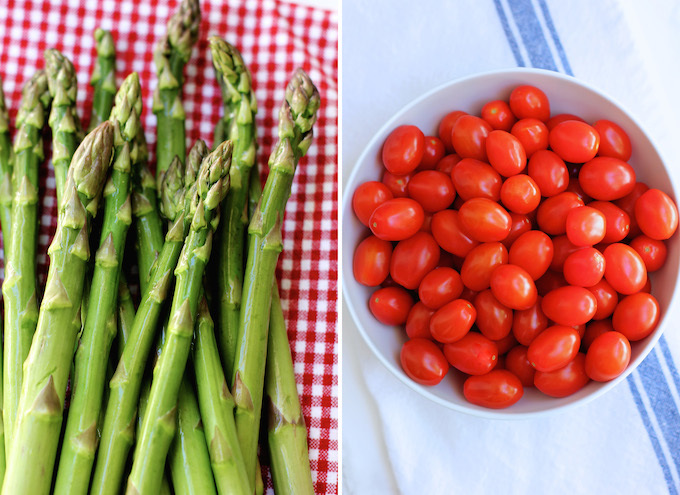 I love using seasonal ingredients in salads and right now asparagus is the star at the market. 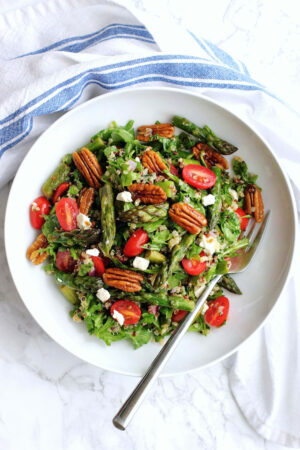 This salad combines sautéed asparagus with quinoa, peppery arugula, sweet cherry tomatoes and crunchy pecans. A touch of salty feta cheese and a bit of red onion are added to the mix. The salad only needs a light, lemony vinaigrette to pull it all together. I used thick asparagus and it took about 5 minutes to sauté. If you are using thin asparagus you’ll need to cook the asparagus for a shorter time. You want the asparagus tender – but not overcooked. I like to chop up my greens so they are easier to eat – just give them a quick, rough chop before adding to the salad bowl. I soak my red onions in a little bit of water before adding them to the salad – this eliminates some of the raw onion flavor. 1 1/2 cups of cooked quinoa – (about 3/4 cup uncooked – prepare as per the package instructions). 1 bunch of asparagus – about 1 pound – tough ends snapped off – sliced into bite sized pieces. Cook quinoa as per package instructions. When done, set aside to cool. As quinoa is cooking, sauté chopped asparagus and 1 clove of minced garlic in 1 tbs of olive oil over medium high heat for 1 minute in a large sauté pan. Turn down heat to low, cover the pan and sauté for 4 more minutes – stirring occasionally. Test your asparagus to see if it’s done – it should be tender but not overcooked. When asparagus is done, set aside to cool. Roughly chop the arugula and add to a large bowl. Slice cherry tomatoes in half and add to the large bowl. Add diced feta, minced red onion and pecans to the large bowl. Add cooked asparagus and quinoa to the large bowl. Make the dressing by whisking together 3 tbs olive oil, lemon juice, 1 minced clove of garlic, black pepper and salt. Pour the dressing over salad and toss gently to combine. Oh, this looks good! I’m gonna make a vegan version of this. It seems like the weather man is always trying to get us worried!! I’m glad to hear it’s nice and flowery in LA, we are just seeing some tulips pop up here in Calgary and I am SO READY for some greenery in my life 🙂 This salad looks delicious, I love all of the flavors and textures you have in there!! Tulips are always the first sign, Denise – before you know it everything will be green! Such a great sight! How did I miss this beauty? Absolutely love this recipe, Geraldine. I’m going to make this week and put a piece of blackened salmon on top. (totally into salmon these day, lol). Sometimes I just peel the top layer of skin from the asparagus when I’m serving it in and salads and leave it raw. It’s so tender underneath, it can be left uncooked. I find I can only do this with the thicker pieces though. I just love your photos – so fresh and vibrant! Your Spring days sound so perfect. It’s been a long time coming but it’s slowly getting here. I have yet to try raw asparagus in a salad, but you’re inspiring me, Robyn! Thanks for the lovely comment! Hope spring shows up very soon for you. What a beautiful selection of ingredients in this dish! The pecans are the perfect accompaniment! This is such a stunningly beautiful salad, Geraldine! Nothing is better than fresh asparagus during the Spring, and this salad highlights all the best parts of the season. I need to try this! Thanks so much, Rachel – hope you try it! Well I am all for lush green plants growing everywhere, so I bet that is lovely in LA right now! I am LOVING spring this year (OK, every year), and love this spring salad! So many great ingredients going on, the asparagus, the pecans, the feta! So good! Spring has been wonderful this year in LA, Meghan – glad you’re getting a lovely spring too! This is my kind of salad, Geraldine! How perfect for spring with the asparagus, too. I love how you’ve brightened it all up with a lemon dressing, plus that feta must give it a wonderful salty element. The Bay Area has been gorgeously green this month too – all that rain was tough for a while, but so worth it 🙂 Hope you’re doing well!! Hi Julia – so glad you guys are getting some nice weather after all the rain you got. We did not getting anywhere near the amount of rain predicted but the little bit that we did get really made a difference after 3 years of no rain. Love seeing everything so green! All the color you speak of get me so excited for our (colorful) spring to officially hit…love it! Oh yes – I’ve been cooking with a lot of asparagus these days – as a matter of fact – I have a fun one coming tomorrow! Yay! This salad speaks to me heart, my dear! There’s nothing I don’t love! Thank you for sharing! Thanks so much, Annie – loved your roasted asparagus with crispy fried egg recipe! Don’t you love how versatile asparagus is! Me too, Greg! After 3 drought years, this spring has been just lovely here in LA. Ooooh! It sounds like California is starting to look quite lovely. We’re not quite there yet in Boston. . .but I suspect it will be coming soon (at least it is sunny). This beautiful salad is certainly making me yearn for summer barbecues. Hopefully, spring will arrive soon for you Lynn! And yay for summer barbecues! Hooray for the rain that brought the spring flowers! I love spring time and everything that goes with it. This salad looks so light and flavorful and healthy! All the required parts for making a perfect salad! Hi Kathy – this spring has been so lovely here – after the last 3 drought years the bit of rain we’ve had has made such a difference. It’s amazing how audible those lovely spring birds are (and, err, rather early too) but that is not much of a complaint, they always make me smile. We’ve been living here nearly 3 years and it’s the first time we’ve seen green in the hills — we thought that brown was just the native dry desert colour and now we cannot get over the change and vibrance. We seem to have gotten more rain here in NorCal especially during Miracle March (as some are calling it) happy to read that most of the key reservoirs are restored to average levels. Seasonal is the perfect way to describe this gem of a salad Geraldine. I like how you power it up by layering in flavor and texture and then allowing the ingredients to shine with a simple and fresh lemony vinaigrette. The combination of asparagus, arugula and feta sounds absolutely delicious. Your salads are always so pretty too! Well done. The noisiest tweeter here is the mockingbird, Kelly. He’s looking for love and starts tweeting earlier and earlier each day – sometimes as early as 2am! I’m hoping he finds love soon. Hope all’s well with you. I agree, it’s been a spectacular spring so far here in California, and I can’t think of a better way to celebrate than with a salad like this! Hasn’t it just been gorgeous, Sue! Yall were totally in need of rain and I’m happy to hear it finally arrived. It sounds like a beautiful oasis in the desert, Geraldine. Bougainvillea is such a vibrant flowering bush. I wish it grew up here. Mmmm, peppery arugula with asparagus is a perfect combination! I just started seeing local asparagus around here and I’m thrilled! There’s nothing like it and fresh is the beeest! Thank you for this fabulous salad my dear! Thanks so much, Traci! The Bougainvillea this year has been so spectacular this year – it’s blooming everywhere – pinks, purples and red – just gorgeous. I LOVE all the ingredients you’ve brought together for this salad Geraldine! The colors scream spring to me!! Hope some nice weather will be heading my way soon too! Enjoy your week! Thanks, Mary Ann – spring will get to you before you know it! Glad you guys got a lot of rain, Geraldine! Lush green fields for you! 😉 Love this salad!! So beautiful, filled with deliciousness and the perfect way to kick off spring! You loaded this baby up with great textures and flavors! *Swoon* I have everything to make this for lunch today! Yay! Cheers, dear – to a week as wonderful as you! Thanks so much, Cheyanne – hope spring is showing up in your neck of the woods!